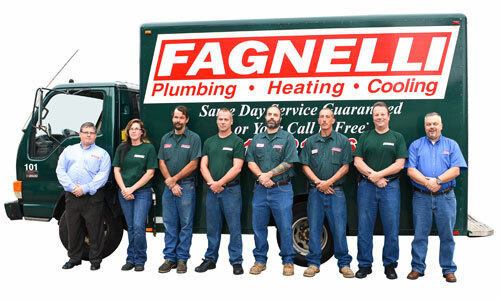 No matter what your plumbing needs may be, you can count on the professionals at Fagnelli for quality service and expertise. Our staff consists of certified plumbers providing 24/7/365 emergency service. Don’t let plumbing problems disrupt your day, call Fagnelli and get back to your life. One of our biggest strengths is recognizing and providing our customers with immediate service so that their business interruptions and inconveniences to their employees, customers and family is kept to a minimum. We currently employ a total of fifteen service personnel. This includes three certified master plumbers, three journeymen, three apprentices, one factory trained boiler and hot water service technician and related skilled tradesmen.